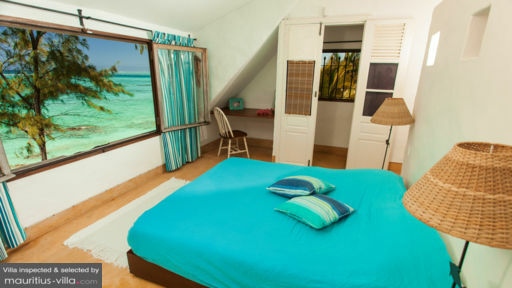 Located in Trou D’Eau Douce, one of the most charming and picturesque coastal villages of Mauritius, Blue Moon Villa offers both budget-friendly and comfortable accommodation on the beach. The ideal spot to enjoy glorious sunrises, this villa oozes coziness and comfort, which is ideal for holidays with your significant other or even your family. 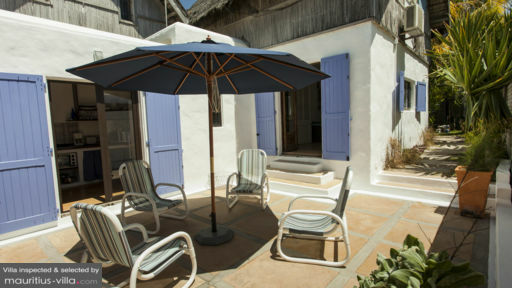 Entirely self-catering, you benefit from free WiFi as well as a wide range of additional services. Blue Moon Villa also has the advantage of being a mere 25km from the airport. Guests here can easily also enjoy the numerous tourist spots found in the neighbourhood. Overlooking the ocean, the Master Bedroom at Blue Moon Villa is equipped with a queen size bed which promises a good night’s sleep. Fully air-conditioned, the bedroom also provides access to a bathroom with sink, shower, mirror, hair dryer and toilet. A closet is also included where you can stow your valuables. Master bedrooms are additionally equipped with bed lamps as well as a desk and chairs. Guest bedrooms are equipped with three beds: a twin bed as well as a bunk bed with two mattresses. A third guest bedroom can also be found in the attic, with a double bed. The bedrooms are air-conditioned. Nothing can beat the great outdoors you will benefit from as a guest of Blue Moon Villa. Indeed, this idyllic accommodation opens right on a glorious stretch of white sandy beach fringed by an endless ocean of sparkling turquoise. Enjoy calming walks on the beach as you dig your toes into the wonderfully humid sand and watch the golden sun sink beneath the horizon. If you don’t want to leave the secluded privacy of the villa, rest assured that the villa does come with a sweeping sun deck that overlooks the ocean. This deck contains a variety of outdoor furniture such as a coffee table and chairs for Al Fresco dining under the stars. Sun loungers have also been set up where you can enjoy an ice cold beverage as you lose yourself in your favourite book while soaking in as much sun as you want. Because of the proximity of the nearby filao trees, you will be able to benefit from maximum sunlight while still enjoying a cool and refreshing breeze. The villa is also nestled in the midst of abundant foliage which graces the evening air with the wonderful aroma of tropical plants. It should be noted that the beach area is entirely private and serves as the front yard. The upper floor is also equipped with a terrace which also contains outdoor furniture where you can sit and enjoy the soft sound of the waves as you breathe in the evening air. Guests can also enjoy barbecue facilities. Because it is entirely self-catering, this villa has a fully-equipped kitchen where you will be able to prepare your meals just as you like them. The kitchen contains just about anything from a fridge to a gas stove, sink and dishwashing products. It also includes a dishwasher, a microwave as well as all the utensils and amenities you will need to prepare your meals. In the living area, you will also find a dining room that can seat several people as well as a living room. As far as the services are concerned, guests can benefit from free WiFi during their holiday. The staff can additionally take care of your laundry and ironing. 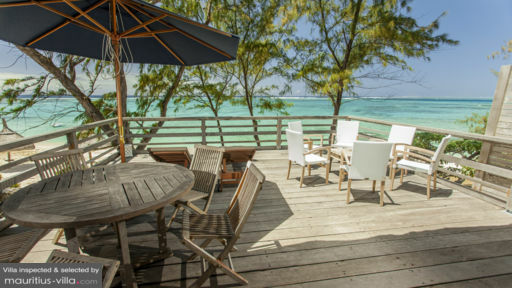 The staff can also cook delicious Mauritian meals (1 cooking per day is included in the rental price). Free parking is available at the villa. Blue Moon Villa is only 7km away from the prestigious Four Seasons Golf Course, where you can enjoy panoramic views of the ocean and mountains as you enjoy a good game of golf. Around half an hour from the villa is also found the world-famous Blue Bay Marine Park which you can discover by glass bottom boat. If you want to indulge in some shopping, head over to the nearby village of Mahebourg where you will undoubtedly be enchanted by the numerous and colourful stalls full of coral necklaces and earrings, sarongs, beaded sandals as well as a variety of local delicacies.